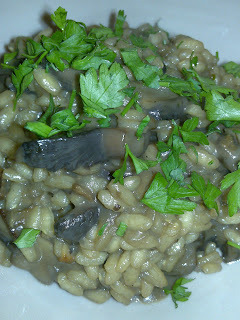 A low fat version of Nigella's mushroom risotto, but almost too low fat. I found myself, for the first time, thinking i might have to supplement the amount of butter suggested, rather than halve it! 10g butter is suggested in the recipe, but i used 20g in the end, as there wasn't enough to coat the rice, which i think is the unlying point of risotto. However, it's still quite a low fat version, particularly when compared to her Pea Risotto, but still has a great depth of flavour, if not the extreme silkiness from using more butter or cream. - Melt 20g butter and 2 teaspoons olive oil in a pan and gently fry 1/2 onion. - After a few mins, add 200g mixed sliced mushrooms and cook for a further few mins. - Stir in 125g arborio rice and cook for 2 mins. - Add 60ml vermouth or white wine and allow to bubble until absorbed. - Cook until absorbed, add another ladle, and so on, until add the stock is used up and the rice is just cooked and creamy. 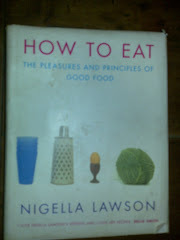 - Stir in 2 tablespoons parmesan and sprinkle with parsley. I also added a slice of lemon on the side, because i think a squeeze of lemon is generally delicious with risotto and added at the end, lifts the whole dish.